How and When Did Scrooge McDuck Take Over Disneyland? New Orleans My dad was born and raised in Orange County, California, first in Tustin, then Santa Ana, and finally Orange itself where he lived until he finished high school. My grandfather was a foreman on an orange grove ranch until he couldn’t be, and then he worked as the janitor at the Lutheran Church, next to the parochial school that my dad, his brother and three sisters all attended at various times. My dad used to tell us about delivering papers on his bicycle before dawn along the hills covered with orange groves that are now all occupied by one housing development after another. We used to drive out to visit my grandparents in California every five years after we moved to New Orleans. Of his two weeks of his vacation, we would spend three days driving out and three driving back, leaving at 4 AM in the morning to beat the humidity of the Gulf Coast and then the aridity of the desert until we arrived. Once we went by his cousin’s carpet store to watch them build the Angels stadium in Anaheim. We once went to Knott’s Berry Farm. Twice we went to Disneyland. I was shocked to read in an old copy of the New York Times that 85% of the 17,000 Disneyland unionized workers make less than $15 per hour, and that’s in California where the minimum wage is over $10 per hour, not $7.25, and on its way to $15 by 2022. Furthermore, that’s in Orange County, not Sunflower County, Mississippi where my mother was raised. Living costs are in another dimension in California. The Times references a California Budget & Policy Center that calculates that a single adult would need to make $33,000 to meet a basic monthly budget, which is about $16 per hour at full-time work. The story followed several Disney workers around as they slept in their cars, brushed their teeth at Starbucks, and tried to make it on their less than full-time shifts. Disney is the largest employer in Orange County. In 2017, the company made almost $9 billion in profits. In the 3rd quarter of 2017, the parks and recreation segment of Disney, which includes Disneyland and Disneyworld in Florida, was the only major division that beat expectations with $1.2 billion operating income in that quarter alone. No question, Disney has the money. And, these workers have a union now and forevermore. Walt Disney built the place union, and it was been union since it opened in California. Even Disneyworld in Orlando is union in anti-union Florida. The unions are organized in various trades councils where in theory every union and craft are part of the bargaining and representation from the skilled trades in maintenance to the large number of service workers in the hotels that are part of UNITE HERE. Usually, we would think this is a great thing, but what’s gone wrong in Orange County that is allowing Disney to be Scrooge McDuck in dealing with its workers? This should be Neverland, not Frontierland. 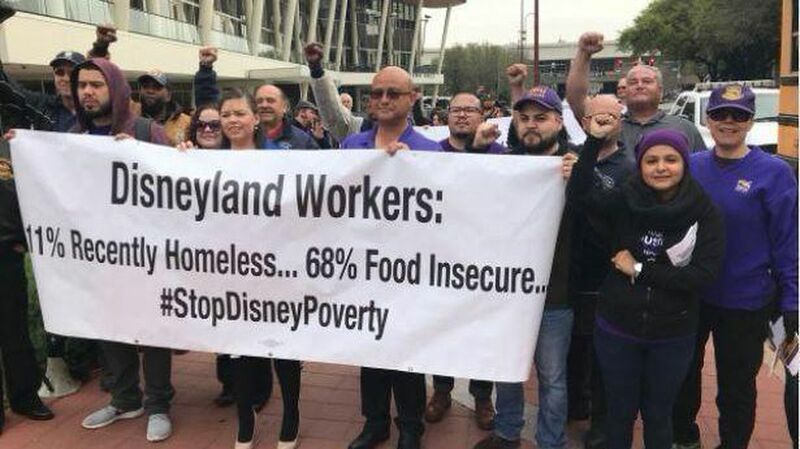 The Times story was triggered by a union-backed survey that indicated that 75% of the responding workers said they “do not earn enough money to pay for their basic monthly expenses, and one in 10 said that they had been homeless in the past two years.” Clearly, we must demand that the unions stand up to Disney to force this rich company to pay living wages or make sure that visitors stop allowing their children to witness this daily hypocrisy in the name of profits. This entry was posted in Citizen Wealth, Financial Justice, Labor Organizing and tagged Disney Workers, HERE, labor unions, living wages, poverty by Wade. Bookmark the permalink.